Super 2048 update with French language translation and added Alphabeta play mode in settings. The new update improved the app tremendously, much smoother gameplay and cleaner design. 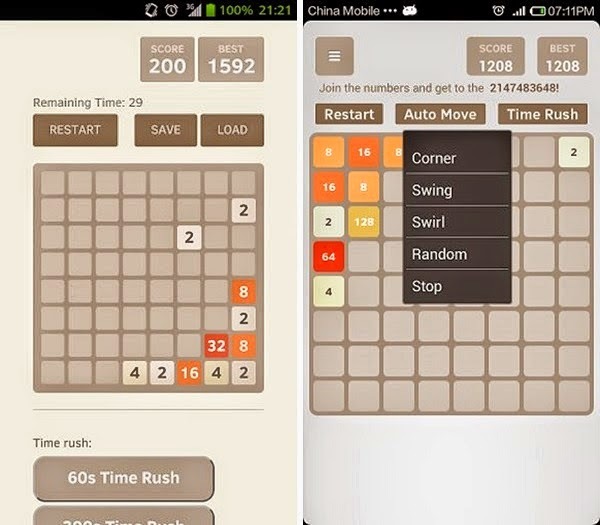 Like play with 2048, just swipe to move all tiles to merge them together and your score will increase as fast as more cell you will combine. Let's play and try to get greater numbers and more scores. This game is so much fun and addicting. Goes to show how taking something small and multiplying it into something huge can make something, that is the same as the original yet so much better. It's not quite what you would expect from 2048 since it's so huge but it's exactly the same and it makes the game addicting for a million times more. - Time Rush: Challenge more scores and greater numbers in limited time. and you can continue playing it after timeout. - 600s time rush and more. - Fixed auto move can't stop after game over. - Added French language translation. - Added Alphabeta play mode in settings. - Added move animation switch in settings. - Added Contribution page in settings to thanks people who provided multi-language tranlstation.